On Tuesday, September 21, 2015, the WOA Detachment Commander, Lt. Commander Metcalf, attended our parade night to make a special presentation on behalf of RCSU Central Commanding Officer, Lt. Colonel MacMillan, who honoured our Corps with a Commanding Officer's Certificate of Commendation. Five of these were recently awarded in Western Ontario Area which consists of almost 100 cadet units. "In recognition of your dynamic and structured local training program which has maximized cadet participation and introduced cadets to Orienteering and Marksmanship. Your efforts have met with great success at both regional and national levels and are indicative of your endeavors to deliver a challenging and rewarding experience to Strathroy's youth. Your strong community ties and support of community events have endeared you to the people of Strathroy. The hard working, can-do mindset of the Cadets at 11 RCACC has impacted your affiliated Unit as well. 4 RCR is quick to acknowledge the positive aspects that the relationship with 11 RCACC has had on their Unit. Your professionalism, enthusiasm and commitment have set a high standard amongst all cadet corps and squadrons in Central Region." Needless to say, I am extremely proud of this Corps and the teamwork demonstrated by all to achieve this recognition at the provincial level. Thanks to our fantastic cadets (goes without saying), staff members , Support Committee, our primary sponsor - Royal Canadian Legion Branch 116 and the Army Cadet League of Ontario who have all played a part in #11's success. 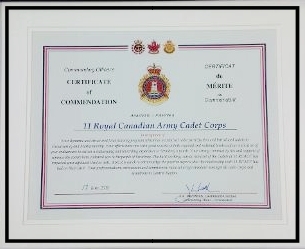 Everybody had a hand OUR Corps achieving this award and I am very humbled and grateful to have had the honour of being your Commanding Officer during a time where our Cadet Corps has been recognized as a model unit for all others to be measured by within our Region. 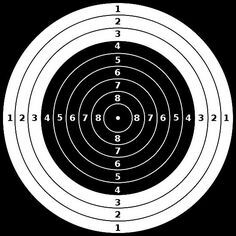 Placed 7th overall out of 23 teams competing on Saturday at the Provincial Marksmanship Competition held at CFB Trenton held on 11-12 April 2015. The team was only a few points out of a medal position this year and is now ranked #7 out of 290 teams in the Province of Ontario. In addition, M/Cpl Malena Sidebotham placed 2nd overall in the Junior Category taking home a Silver Medal and earning a place on the Ontario Composite Team at the National Competition which was held on Sunday. Not all provinces have reported their results yet, but at present, M/Cpl. Sidebotham is ranked as the #10 Junior Shooter in Canada.